NEVER DO FOR A CHILD WHAT HE CAN DO FOR HIMSELF. A DEPENDE - ProudMummy.com the Web's Community for Mums. "NEVER DO FOR A CHILD WHAT HE CAN DO FOR HIMSELF. 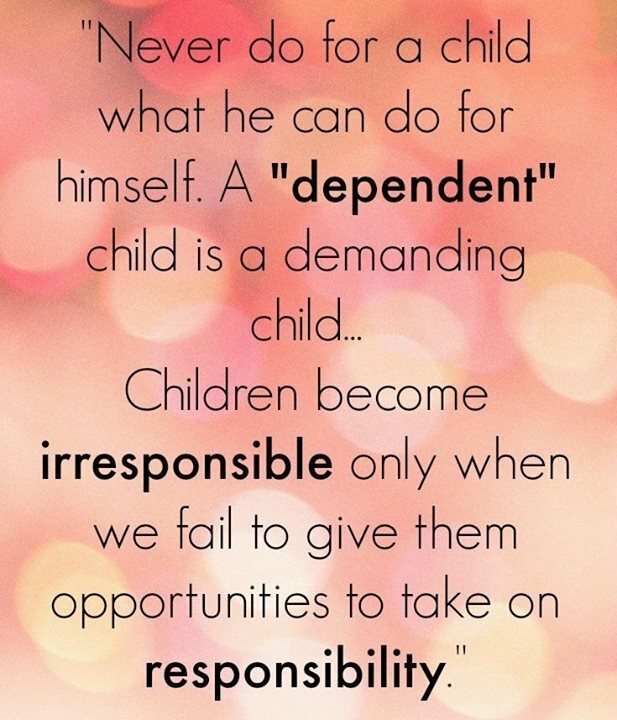 A "DEPENDENT" CHILD IS A DEMANDING CHILD... CHILDREN BECOME IRRESPONSIBLE ONLY WHEN WE FAIL TO GIVE THEM OPPORTUNITIES TO TAKE ON RESPONSIBILITY." Exclusively only Boys I see.